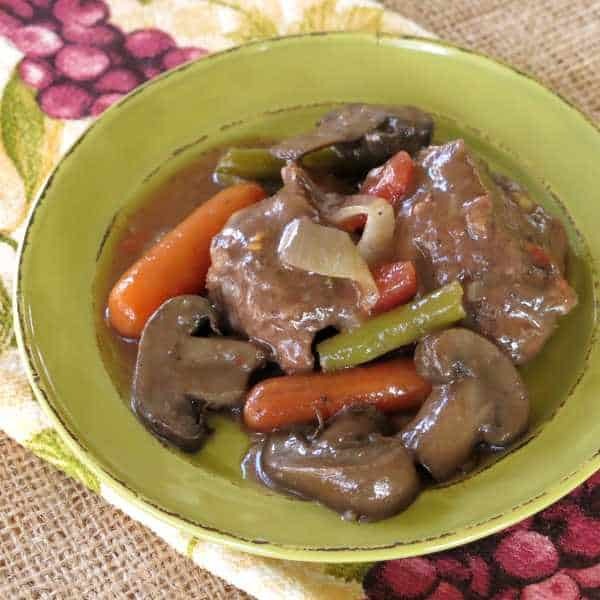 Slow Cooker Beef and Vegetables simmer all day in a rich Red Wine Sauce that is out of this world. This dinner is special occasion worthy and weeknight friendly! Imagine beef and vegetables slow cooking all day in a red wine sauce that fills the house with an amazing aroma of good things to come…with very little effort on your part. Just dish it out and enjoy. It’s loaded with vegetables, so it’s a one pot meal. 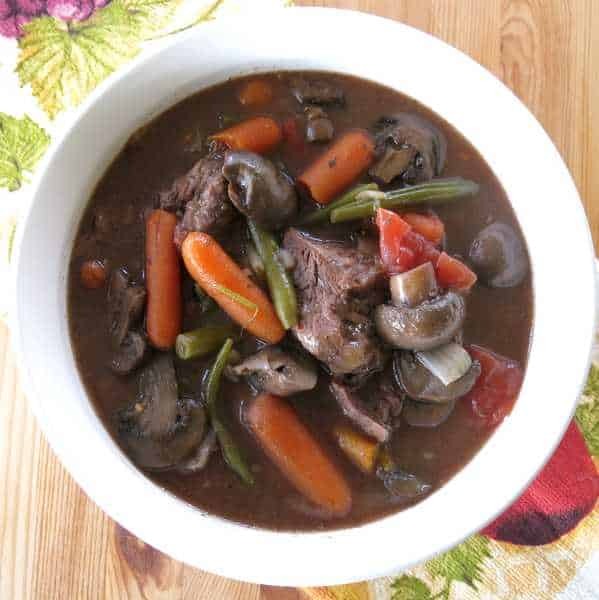 This recipe is similar to Crock-Pot Beef Bourguinon (an easy version of a Julia Child specialty) since they both use beef and red wine. The Bourguinon has a French flair. On the other hand, the flavor profile of this beef stew-like recipe favors Italian cuisine with stewed tomatoes and Italian seasoning. Make plenty! Twist arms, do what you must to have leftovers for the next day so you can make these Mini Beef Pot Pies with Crescent Rolls. This dinner definitely gives off the impression that you slaved all the day in the kitchen. In reality, there is a little prep at the beginning of the process and a minor step at the end. Both are worth the time and effort. Why do you have to brown meat before slow cooking? This step that is not required, but is highly recommended. It’s the secret to tender beef stew meat. Searing the beef cubes on the stove top before they go into the crock-pot will give this dish a deeper flavor. It also looks more appetizing (in my humble opinion!) To sear the beef, blot the cubes dry with a paper towel. Heat oil in a frying pan over medium high heat. Place the beef cubes in the pan and allow them to sizzle and cook for about 2-3 minutes on each side. Don’t crowd the pan. Work in batches, if necessary. In my utopia there are lots of veggies in this dish…mushrooms and onion for me, green beans for my hubby and extra carrots for my darling daughters. I’ve tossed in celery, peppers and potatoes at the beginning of the process and stirred in spinach at the end. Sometimes I cut back on the meat and double the vegetables (and I’ve added chick peas too!) Customize the vegetables based upon seasonality and preferences. Please rate the recipe and tag @DinnerMom or #DinnerMom on social media if you make the recipe. We’d love to know what you are cooking up! 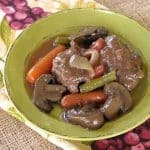 Slow Cooker Beef and Vegetables simmer all day in a rich Red Wine Sauce that is out of this world. 2 handfuls of baby carrots or 2-3 large carrots cut into 1-2 inch pieces. Blot meat dry with a paper towel and then transfer it (in batches, if necessary) to the pan. Sear beef cubes for 1 to 3 minutes on each side. As beef cubes are done, transfer them to a crock pot. 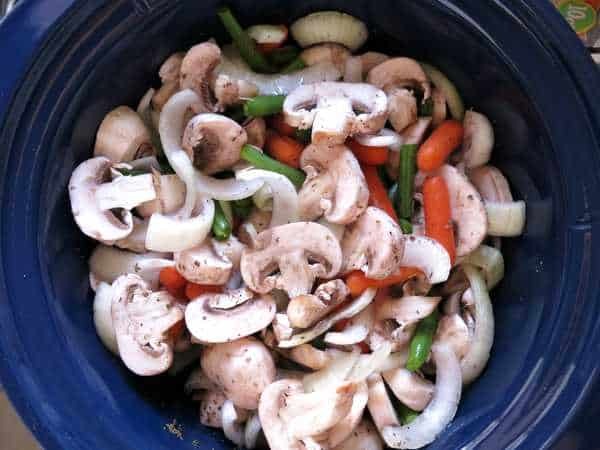 Add onions, mushrooms, carrots, beans and tomatoes to the crock pot. Stir broth, wine, Italian seasoning, salt and pepper together in a small bowl and then pour over beef and vegetables. Cook 4-5 hours on high or 6-8 hours on low. About 30 minutes before serving time, stir together flour and cold water (or corn starch and water) and create a slushy mixture. Add slush mixture to the crock pot and stir into beef and vegetables. Cook for 30 minutes more and then enjoy! Dish is gluten-free if corn starch is used as the thickening agent. 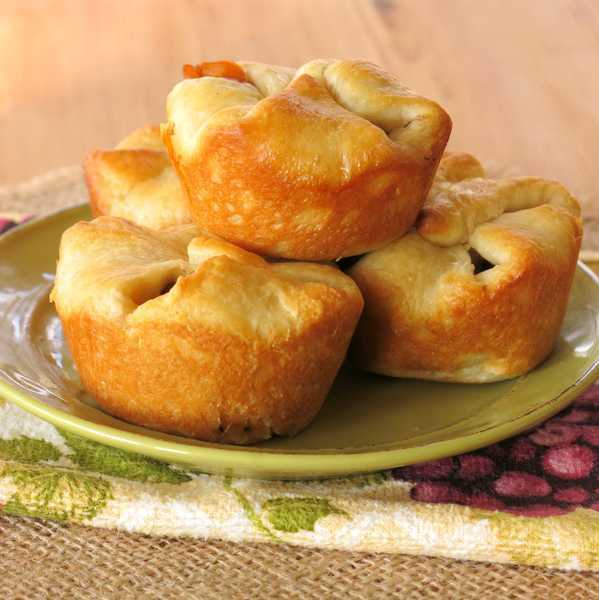 This recipe is the perfect filling for Mini Beef Pot Pies made with Crescent Rolls. I love using my slow cooker and even more I love having left overs! Your beef looks perfectly tender and that sauce on it looks fabulous too! Amazing comfort food! <3 Love this! Mmmmm crock pot recipes are my favorite! Oh, so much inspiration here! Now I’ve got to get out my crock pot and get cooking. 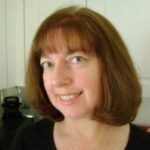 Love the beef pockets…they look so good, Marjorie!! Yes – You are right – I DO need this recipe in my life! Love the little pasty pockets! A big “YES!” to packing these little potpies with tons of veggies, particularly mushrooms. These look fantastic! I love those little pot pies!! So adorable! Ooooh. I totally miss crescent rolls! I know you can make them homemade but they’re never as good as Pillsbury. 😉 Love the red wine sauce in this! Gotta love a meal that can be repurposed the next night! Making this again for a special dinner. The red wine sauce is outstanding!